It's already mid-July and due to the cooler temps this summer, my garden still looks stuck in June. It's uncannily green and as we've had rain nearly every week..my water bill is peanuts compared to the heat of last year. However slowly, the summer blooms are coming along and I have enjoyed spending time outside watching the hummers and dragonflies buzz about. The jacob cline monarda is blooming and the humming birds are delighted. While I am not a fan of red in the garden, I have choosen to embrace this color, or specifically, this plant and I have clumps throughout the garden. It's height keeps the hummers safe from prowling felines and they just seem to flock to the blooms. Coneflowers are my all time favorites of summer....pictured above is 'Cheyenne Spirit'. They are finally starting to bloom and for me..once the coneflowers blooms, it means summer has arrived. 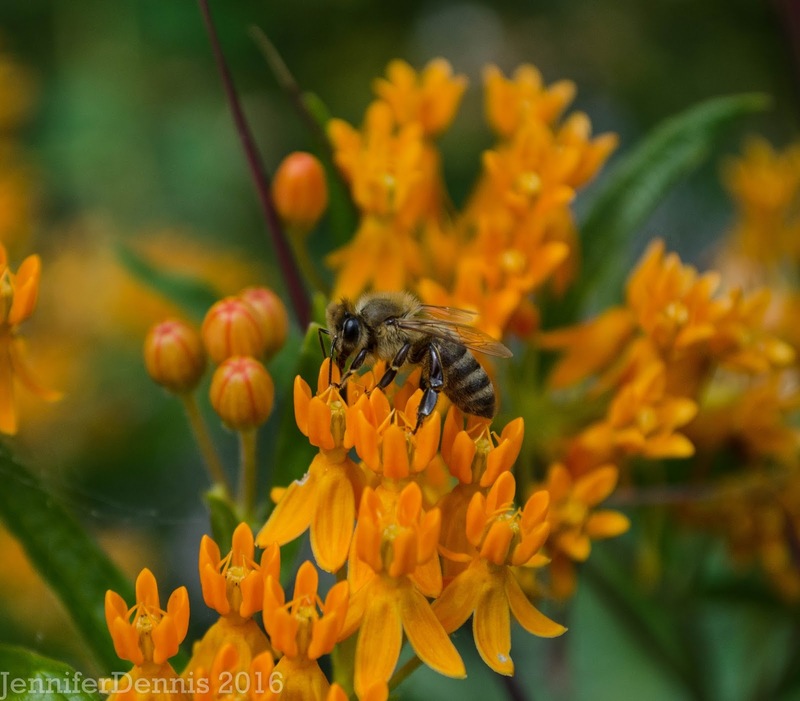 The butterfly weed is a haven for the bee's. My mother was over for a visit recent and told me that she remembers walking through fields of it in growing up in southern Ontario. I can only imagine how beautiful fields of butterfly weed must have looked. 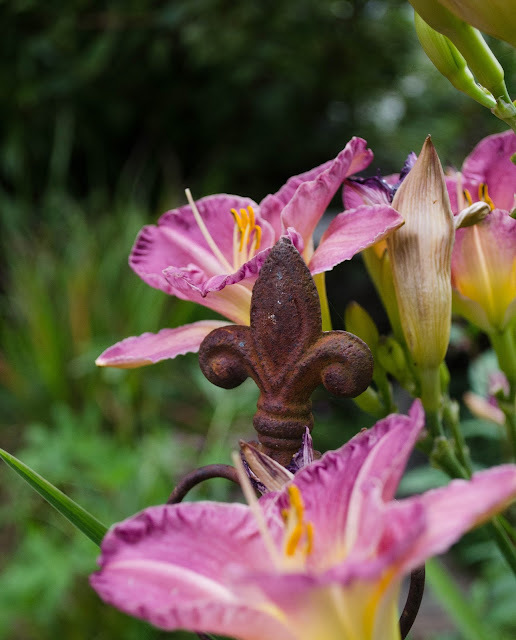 Tried and true in the summer gardens are the daylilies, which are enjoying a banner year. 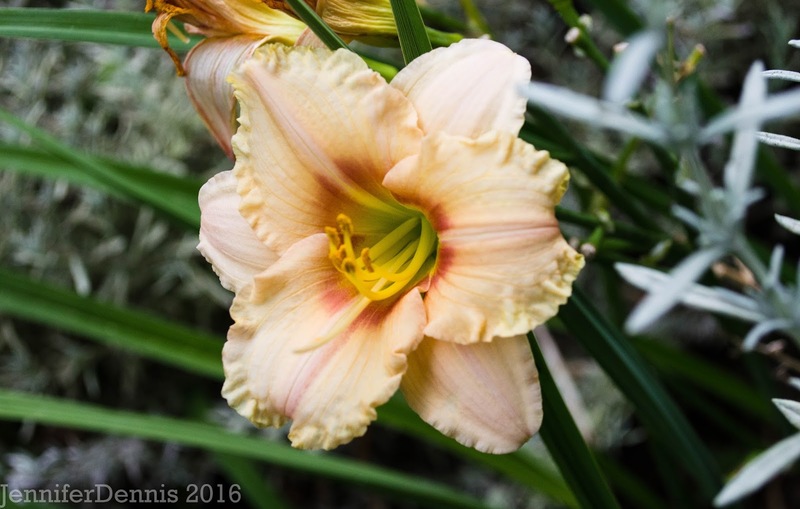 I grow dwarf, reblooming daylilies (hermerocallis). I moved these plants from our previous home, four years ago and they have rebounded and made my cottage gardens a cheerful, fragrant place. I believe this one is 'Optisima' and it is very fragrant. 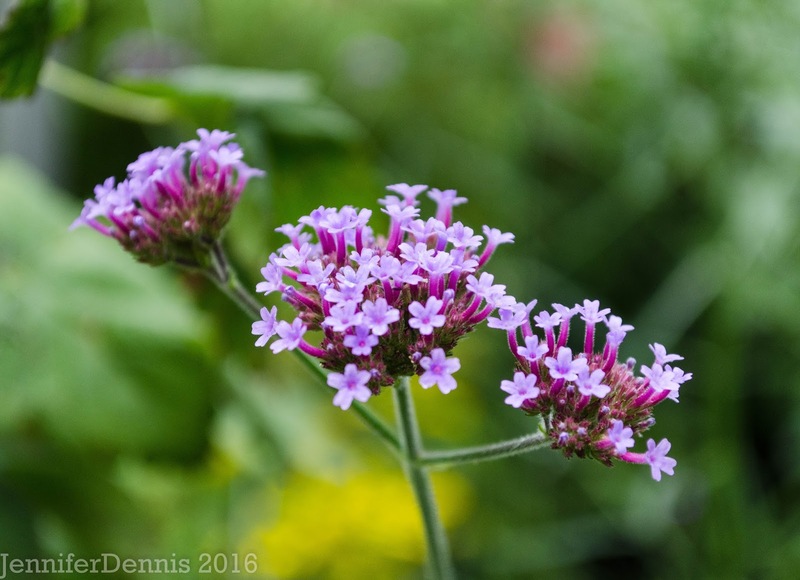 Verbena bonariensis has become a summer staple in my garden. The first two years I could not get a seedling to save my life. However, this year, I have them coming out of my ears. I transplanted many of them around the gardens this spring to further their presence. I really adore their height and simplicity. In the wildflower boxes, my all time summer favorite, 'Bachelor Buttons' are blooming. I love the 'true blue' hue. 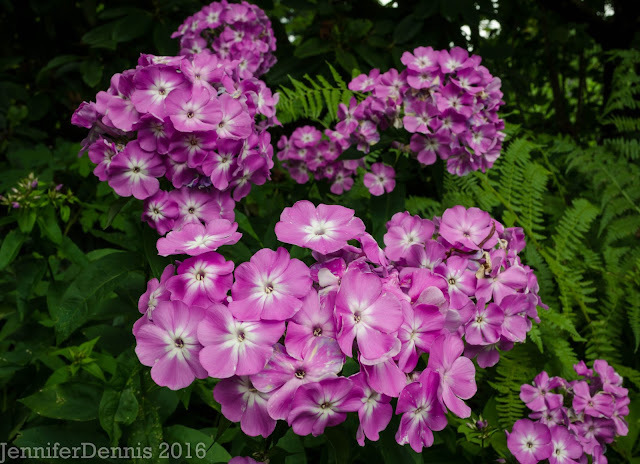 And finally, the phlox, gifted to me by a fellow garden blogger is blooming. I have two large clumps that I may seperate and spread further around the garden. I try not to move plants in the summer, but to just sit back and enjoy what is blooming....difficult as it is. Being in the 'moment' isn't as easy as it sounds but it's a good thing to practice. So 'cheers' to summertime! A time for contemplating all of my fall plant moves, additions and depletions. 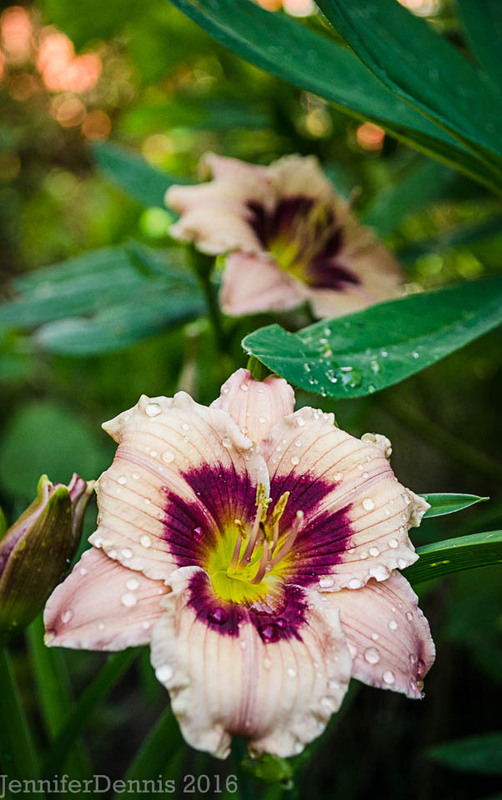 Join Carol over at May Dreams Gardens to see what else is blooming around the world. I wanted to sow Verbena bonariensis this spring, but never got around to it. Maybe next year. "Rain nearly every week" - that sounds like heaven to me! In may slow down your summer blooms but I bet you'll get more flowers in the long run. I've tried Echinacea, Monarda and Verbena bonariensis here with little success - the plants did okay the first season but most didn't even come back for a second round, which is a pity as I love them all. Happy GBBD! Verbena bonariensis flowers and seeds freely all over our front garden. We are really tall strong plant growing in a gap between paving stones growing in front of front window. If I had sown some seeds here they wouldn't have grown. Funnily enough, I have just been potting up some self-seeded Verbena Bonariensis seedlings! 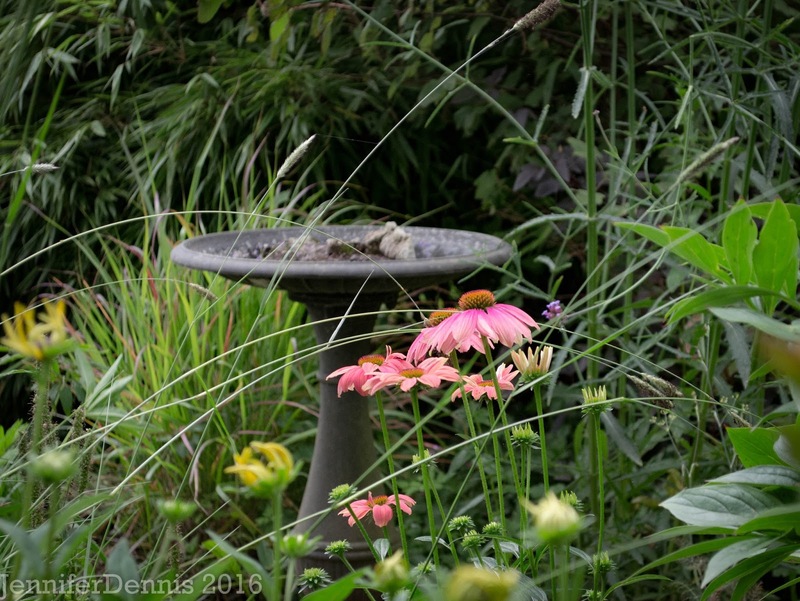 Only one of my Echinacea plants made it through the Winter - the white one. Two years in a row I bought a pink one and two years in a row it died during Winter. 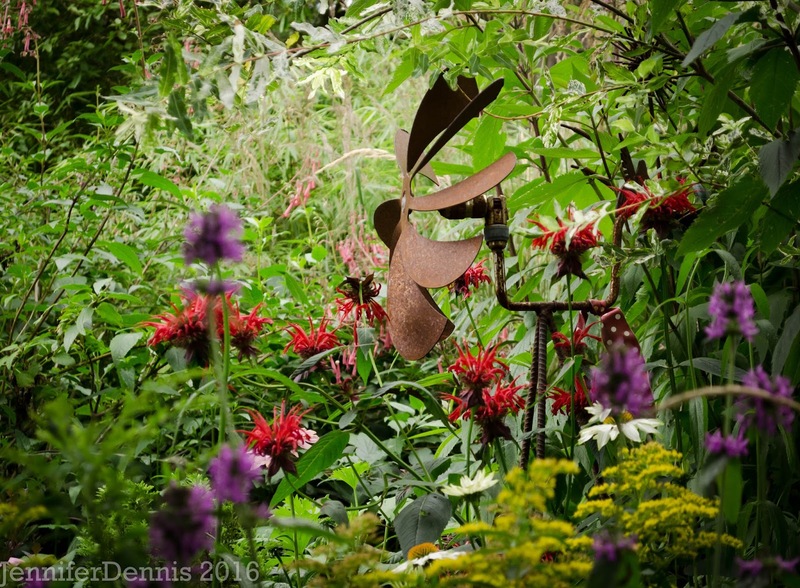 Your rusty garden ornaments are very nice - they add a sense of permanence to the garden. I love all your blooms. Maybe it's especially because I don't have any of the same ones, although I'm trying two plants of Asclepias 'Monarch Promise' that are about to bloom. I really like the look of your simple butterfly weed and need to get some of that orange for my garden! I was thinking the same thing about your garden :) I love seeing your blooms! I've tried to grow more drought tolerant plants in the ground but the clay is so heavy, they die out over the winter :( For now, traditional cottage plants are working. 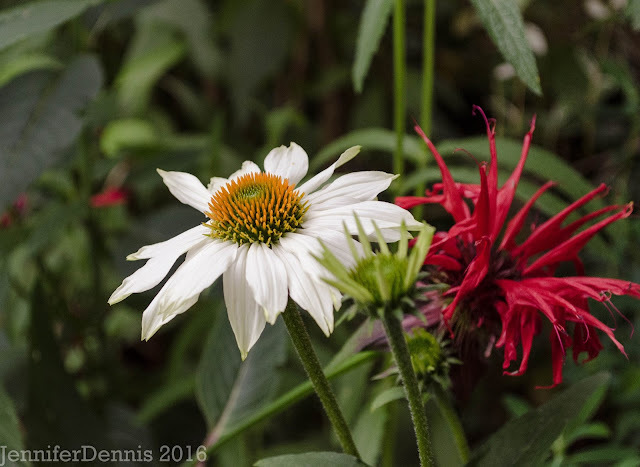 The white Echinacea with the red Monardia gobsmacked me. I grow neither, but that may change. I saw a red monarda for sale recently and let it go. How stupid was I. Yours is gorgeous. Is it invasive though? As always, I'm a big lover of Echinacea...they really are the flower that symbolizes summer for me. 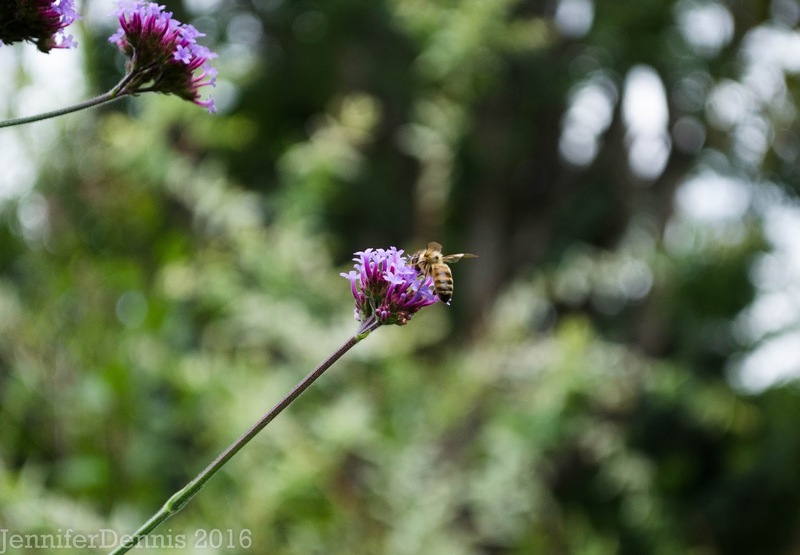 I had the same experience with Verbena bonariensis...it seems like it took years of my planting new plants every year to finally establish enough of a seed bank that I know have them everywhere. It's a very nice garden! I can see that you love Butterflyweed, as do the bees and butterflies. Your garden looks great! V. bonariensis doesn't grow well for me, I wonder why. 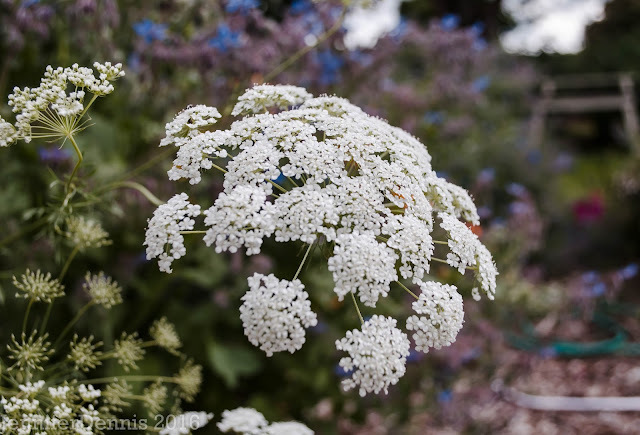 Thanks Jennifer, I love blue one Queen Anne's lace. i am preparing to start gardening in front of my house. 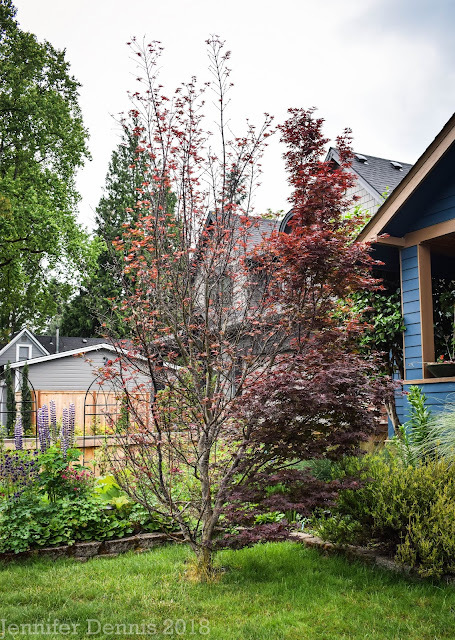 we buy a new house and i just collecting information about new gardening styles and i pick blue one from Symcorp Home Extension Builder your post. 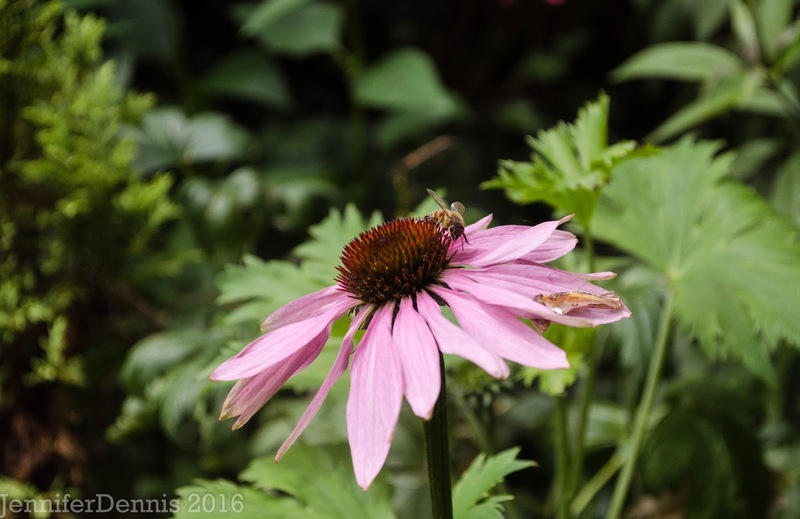 My echinacea had a severe attack of what turned out to be eriophyid mites, they suffered somewhat but were OK in the end. I was advised to spray with dormant oil over the winter, which I did.